The sculpt. Started from zspheres, blocked in the main form, and zremeshed. I have had mixed success with zremesher in the past, but in this case it did a great job and saved me a bunch of time. 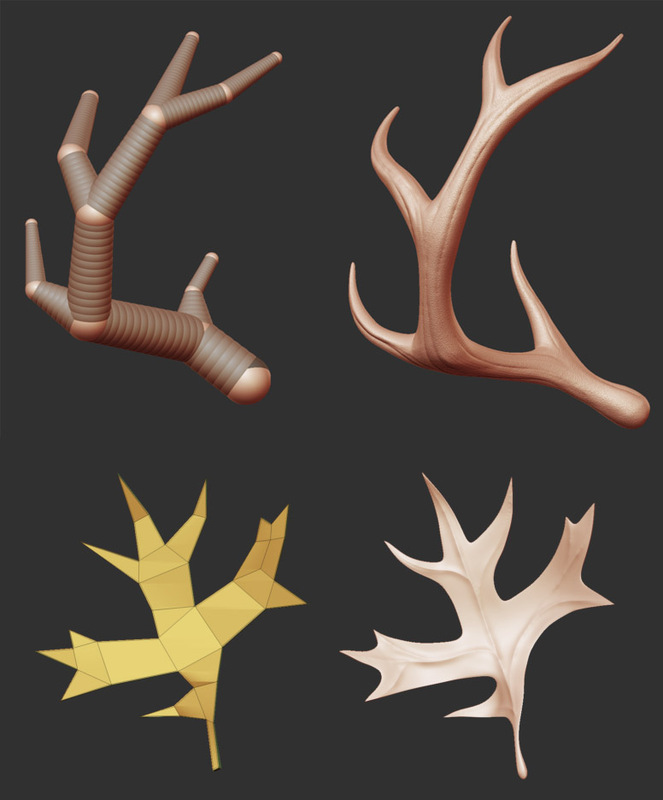 Nothing fancy with the sculpt – move, dam_standard, flatten, etc. This is how I build eyes if I don’t plan on painting them in photoshop. 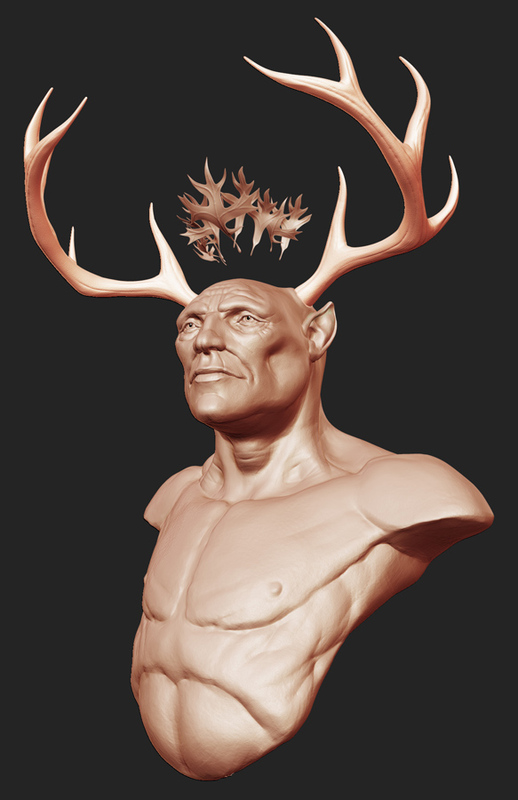 This is a pretty sloppy example, but it looks ok in the final render. The pupil and highlight are just primitive circles. I float the highlight off the surface a bit to give the impression its sitting on a slightly bulging lens. The iris is just a polysphere with the front 2/3rds removed and the normals flipped. I also poly painted it. I haven’t actually done this before but I really liked the results. I wanted to give the impression of warm and cool lights on either side of the model, simulating sun and shadow. If you apply a standard material, you can create interesting lighting scenarios for use in photoshop. Matcaps generally look more interesting, but ignore the light color. 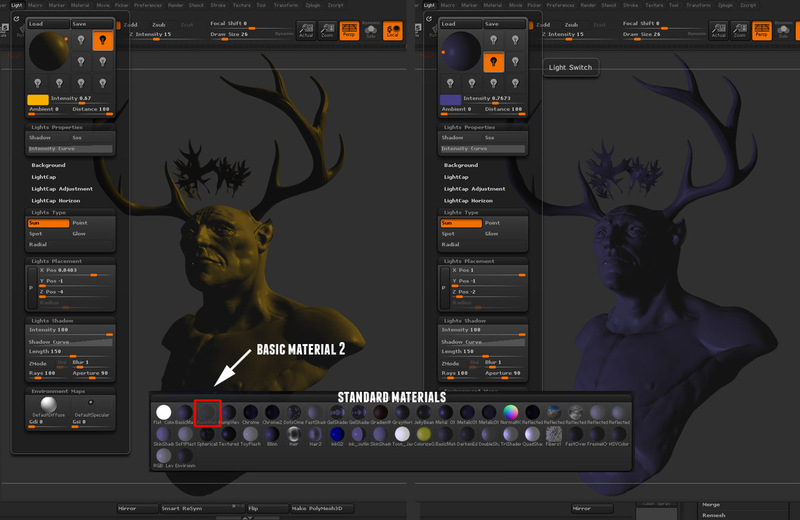 In this case, all you want is the light, not the polypainting, so you have to turn off colorize in the polypaint menu for each subtool. This doesn’t delete the polypainting, it just hides it. You need to get your polypaint render out too – I recommend getting that one before turning the polypaint off on all the subtools. If you’re positive you won’t want to go back to the polypainting, you can always just fill all subtools with white at once using the subtool master Fill tool. 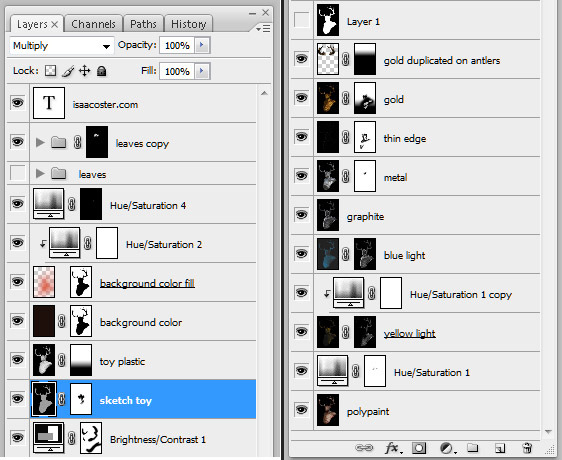 You can also easily save two versions of the same file, one with polypainting, and one without. 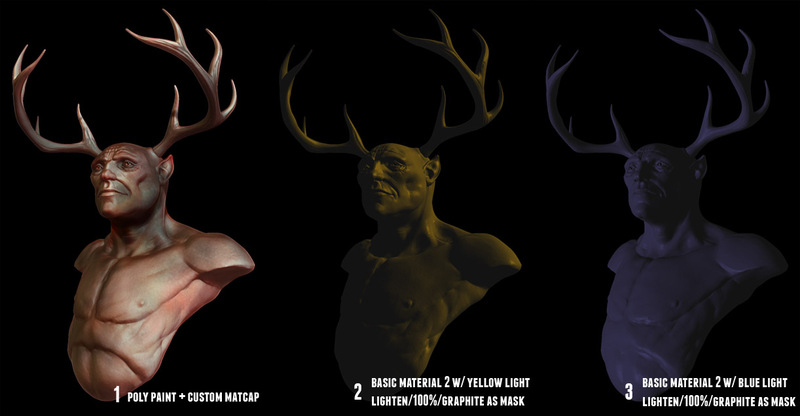 These next three images are all the different materials I used for the final render and where they came from. They are all BPR renders with softer, lighter shadows (turn down the GStrength, turn up the blur). The only one you probably can’t find is the custom matcap. I got it from a paid gig, and I don’t know where they got it from, so I’m not going to post it online. Sorry about that. 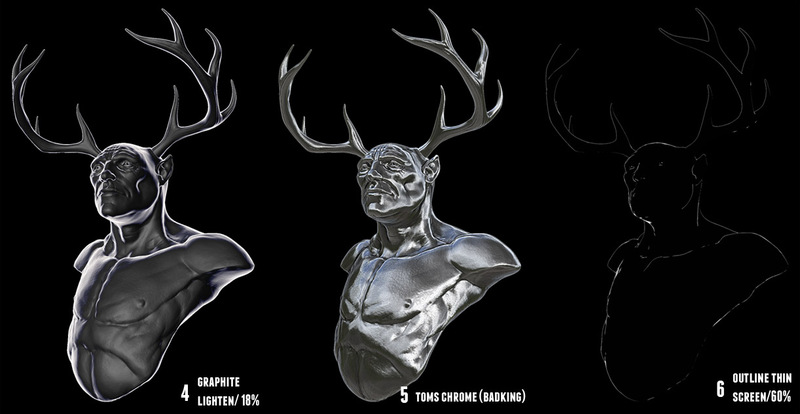 The rest of these are either included with zbrush or available from pixologic or badking. These are the layers. I mostly included it so you can see the masking. Where the masks are black, the layer is transparent. Where they’re white, the layer is opaque. I also used a few hue/saturation and brightness contrast modifiers. 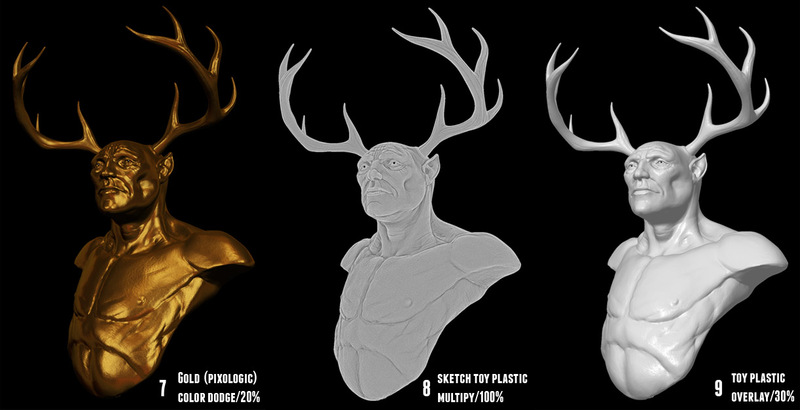 A couple notable examples are the thin edge layer, which is great for rim lighting. It’s calculated by comparing the normal vector of the surface to the camera. If they are almost perpendicular to each other, the surface is white. This means the effect will show up in the middle of the model, like the edge of the nose, even though it wouldn’t make sense for lighting to be there. I paint it out using masking. The other example is the yellow light. I really wanted to keep it limited to the left side of the model, so I used the mask to control where it affected the surface. A breakdown of the layering process.